Fee is 200 baht to be paid the day of. Come join the pool party every Friday to start your weekend off right! 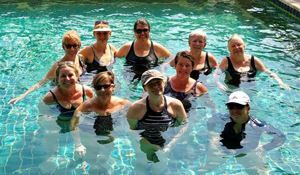 This aqua class is a full-body workout using weights and paddle boards already provided to you. This workout is gentle on your joints, builds muscle strength and increases cardiovascular strength! After class the ladies head down to the restaurant "No Idea" to have coffee and chat! Getting fit and making new friendships. What more could you ask for! Contact Donna, donna_seagle@yahoo.com, for more information.